If you have any questions, please fill out the contact form at the bottom of the page. The practices describe behaviors that scientists engage in as they investigate and build models and theories about the natural world and the key set of engineering practices that engineers use as they design and build models and systems. Crosscutting concepts have application across all domains of science. These crosscutting concepts are the unifying ideas that appears in all of science. Some of these crosscutting concepts include cause & effect and patterns. These new standards will seem odd and cumbersome at first because they are different, but you’ll find it is exactly what good teachers do. The practices describe behaviors that scientists and engineers engage in as they investigate and build models and theories about the natural world and the key set of engineering practices that engineers use as they design and build models and systems. The term practices are used instead of a term like “skills” to emphasize that engaging in scientific investigation requires not only skill but also knowledge that is specific to each practice. The intent is to better explain and extend what is meant by “inquiry” in science and the range of cognitive, social, and physical practices that it requires. Although engineering design is similar to scientific inquiry, there are significant differences. For example, scientific inquiry involves the formulation of a question that can be answered through investigation, while engineering design involves the formulation of a problem that can be solved through design. As you read over the practices, you’ll notice that these are the things great teachers already do to teach students science concepts. A practice of science is to ask and refine questions that lead to descriptions and explanations of how the natural and designed world works and which can be empirically tested. Engineering questions clarify problems to determine criteria for successful solutions and identify constraints to solve problems about the designed world. Both scientists and engineers also ask questions to clarify the ideas of others. A practice of both science and engineering is to use and construct models as helpful tools for representing ideas and explanations. These tools include diagrams, drawings, physical replicas, mathematical representations, analogies, and computer simulations. Modeling tools are used to develop questions, predictions and explanations; analyze and identify flaws in systems; and communicate ideas. Models are used to build and revise scientific explanations and proposed engineered systems. Measurements and observations are used to revise models and designs. Scientists and engineers plan and carry out investigations in the field or laboratory, working collaboratively as well as individually. Their investigations are systematic and require clarifying what counts as data and identifying variables or parameters. Engineering investigations identify the effectiveness, efficiency, and durability of designs under different conditions. Scientific investigations produce data that must be analyzed in order to derive meaning. Because data patterns and trends are not always obvious, scientists use a range of tools—including tabulation, graphical interpretation, visualization, and statistical analysis—to identify the significant features and patterns in the data. Scientists identify sources of error in the investigations and calculate the degree of certainty in the results. Modern technology makes the collection of large data sets much easier, providing secondary sources for analysis. Engineering investigations include analysis of data collected in the tests of designs. This allows comparison of different solutions and determines how well each meets specific design criteria—that is, which design best solves the problem within given constraints. Like scientists, engineers require a range of tools to identify patterns within data and interpret the results. Advances in science make analysis of proposed solutions more efficient and effective. In both science and engineering, mathematics and computation are fundamental tools for representing physical variables and their relationships. They are used for a range of tasks such as constructing simulations; statistically analyzing data; and recognizing, expressing, and applying quantitative relationships. Mathematical and computational approaches enable scientists and engineers to predict the behavior of systems and test the validity of such predictions. Statistical methods are frequently used to identify significant patterns and establish correlational relationships. The products of science are explanations and the products of engineering are solutions. The goal of science is the construction of theories that provide explanatory accounts of the world. A theory becomes accepted when it has multiple lines of empirical evidence and greater explanatory power of phenomena than previous theories. The goal of engineering design is to find a systematic solution to problems that is based on scientific knowledge and models of the material world. Each proposed solution results from a process of balancing competing criteria of desired functions, technical feasibility, cost, safety, aesthetics, and compliance with legal requirements. The optimal choice depends on how well the proposed solutions meet criteria and constraints. Argumentation is the process by which explanations and solutions are reached. In science and engineering, reasoning and argument based on evidence are essential to identifying the best explanation for a natural phenomenon or the best solution to a design problem. Scientists and engineers use argumentation to listen to, compare, and evaluate competing ideas and methods based on merits. Scientists and engineers engage in argumentation when investigating a phenomenon, testing a design solution, resolving questions about measurements, building data models, and using evidence to identify strengths and weaknesses of claims. Scientists and engineers must be able to communicate clearly and persuasively the ideas and methods they generate. Critiquing and communicating ideas individually and in groups is a critical professional activity. Communicating information and ideas can be done in multiple ways: using tables, diagrams, graphs, models, and equations as well as orally, in writing, and through extended discussions. Scientists and engineers employ multiple sources to acquire information that is used to evaluate the merit and validity of claims, methods, and designs. Want to learn more about engineering and engineers? Check out the videos below! National Science Foundation's What Is Engineering? For natural and built systems alike, conditions of stability and determinants of rates of change or evolution of a system are critical elements of study. These concepts need to be made explicit for students because they provide an organizational framework for interrelating knowledge from various science fields into a coherent and scientifically-based view of the world. 1. Have broad importance across multiple sciences or engineering disciplines or be a key organizing concept of a single discipline. 2. Provide a key tool for understanding or investigating more complex ideas and solving problems. 3. Relate to the interests and life experiences of students or be connected to societal or personal concerns that require scientific or technological knowledge. 4. Be teachable and learnable over multiple grades at increasing levels of depth and sophistication. Disciplinary ideas are grouped in four domains: the physical sciences; the life sciences; the earth and space sciences; engineering, technology, and applications of science, and environmental sciences. Performance expectations are the assessable statements of what students should know and be able to do. Performance expectations integrate science and engineering practices, disciplinary core ideas, and crosscutting concepts. Clarification Statements provides examples or additional clarification of the performance expectation. 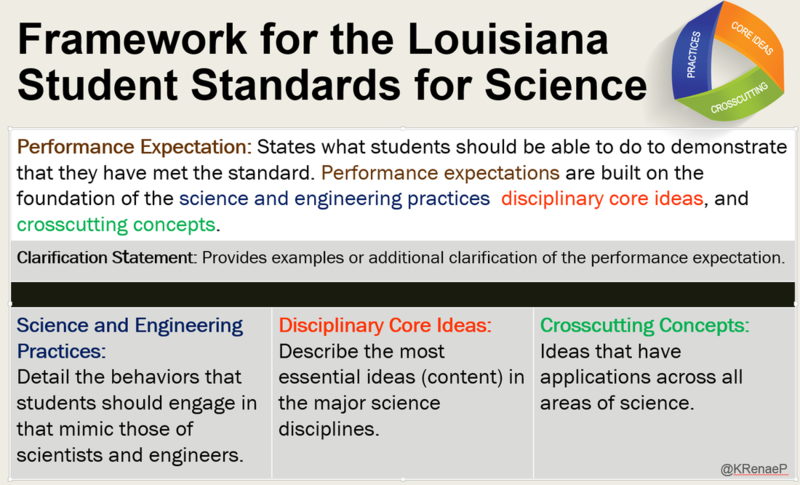 Content knowledge is critical and evident in the standards in the Disciplinary Core Ideas , the key ideas in science that have broad importance within or across multiple science or engineering disciplines. However, simply having content knowledge is not enough. Students must investigate and apply content knowledge to scientific phenomenon. Scientists do more than learn about science; they “do” science. Science instruction must integrate the practices, or behaviors, of scientists and engineers as they investigate real-world phenomenon and design solutions to problems. For students to develop a coherent and scientifically-based view of the world, they must make connections across the domains of science (life science, physical science, earth and space science, environmental science, and engineering, technology, and applications of science). The crosscutting concepts have applications across all domains.